The EDUCATE program was developed by Drs. 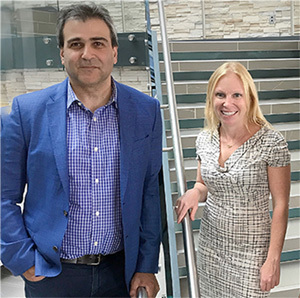 Sheila Sprague and Mohit Bhandari and their team of investigators with the purpose of providing orthopaedic surgeons and health care providers working in fracture clinics with the knowledge and skills that will allow them to comfortably assist women who are victims of intimate partner violence. Providing this assistance will help fracture clinics to improve the lives of women victimized by intimate partner violence by treating the whole person, not just their injuries. The EDUCATE program was designed using the best available evidence by experts in the field of orthopaedics, intimate partner violence, and education. It uses a multi-faceted approach to deliver training, including: an in-person presentation, videos, case sharing, and interactive discussions. It also includes three optional online modules that can be completed by individuals who desire additional training. The EDUCATE program is designed to be both pragmatic and simple in its execution to ensure that it is feasible for busy health care providers to complete. From start to finish the entire program takes only 1 hour. Previous research has found that 1 out of every 6 female fracture clinic patients has experienced IPV within the previous 12 months (this is commonly referred to as current IPV). The COA has a position statement (CLICK HERE to view the position statement) recognizing IPV as a significant social determinant of morbidity and mortality. This position statement encourages members to educate themselves further about IPV and take steps to incorporate IPV identification and assistance into practice. However, orthopaedic surgeons and other health care providers often report challenges identifying and assisting women experiencing IPV. Recent research suggests that these challenges can be overcome with clinical educational programs such as the EDUCATE program. The EDUCATE program is delivered using a train-the-trainer model. To bring the EDUCATE program to a fracture clinic, one or more individuals from the fracture clinic must volunteer to serve as a local IPV champion. The individuals will be provided with specialized training from the EDUCATE team to enable them to deliver the EDUCATE program to their fracture clinic team (CLICK HERE to become a champion and bring the EDUCATE program to your fracture clinic).